The Mind is boldly experimental and something that has acquired a considerable amount of appreciation online. We didn’t get on with it, but that is often the case. We live to kill your darlings. We gave The Mind two stars and most of that was down to a ‘best case’ scenario which we have only briefly glimpsed. I can see why people like it. Those people though don’t include me. Our review was sufficiently controversial that it cost us a few twitter followers and a couple of subscribers. That was unfortunate but I understand completely – many cults require you to cut contact with the non-believers amongst the people you love. As usual though you’re not here to listen to what we did and did not like – after all, if you cared you’d be off reading our review. You want to know if the game is playable. Okay, put your hand on the table. Let’s MIND MELD. Let’s just let… oh no, did you get that thought? I swear that was involuntary. And that one. And that one. Can we maybe just talk about this one rather than read minds? We can keep it much more PG rated that way. I’m sorry, what must you think of me. I guess I did ask for that. No problems at all here – the cards are indicated by numbers only and colour is used nowhere as a channel of information. Life cards are differentiated from the weirdly unthematic shurikens by art rather than colour. Colour is not going to be a problem for anyone playing, so we strongly recommend The Mind in this category. 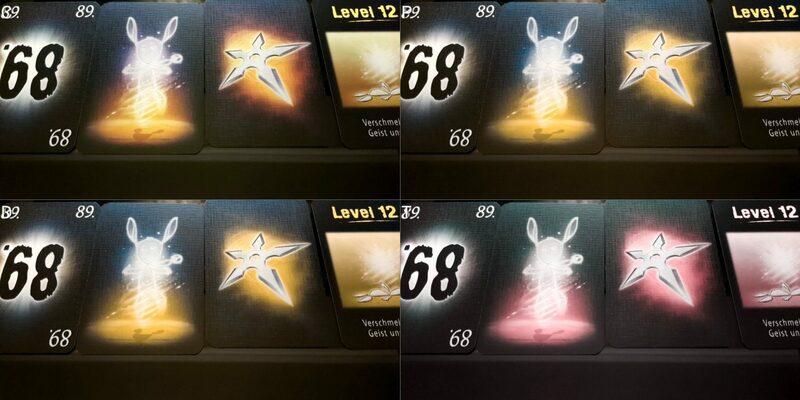 The cards have no tactile indicators, so the extent to which the game is playable depends primarily on whether or not a player can make out large text on a hand of cards. For those for whom total blindness must be considered that’s probably going to make the game entirely inaccessible. You can see the problem here I’m sure – when the cards are rotated, the numbers rotate too and the only indicator of proper orientation is a non-standard dot. Underlining of the 6 and the 9 has been a reasonably consistent approach in gaming – it’s not that it’s necessarily better, more that it’s familiar. The position of the dot doesn’t have a similarly obvious meaning and while it’s not inaccessible in and of itself I think it’s an inferior approach. Underlining is more visually distinctive, is more instantly recognisable, and more cognitively accessible since it doesn’t require people to remember what the dot symbolises – does the dot go at the top or at the bottom? 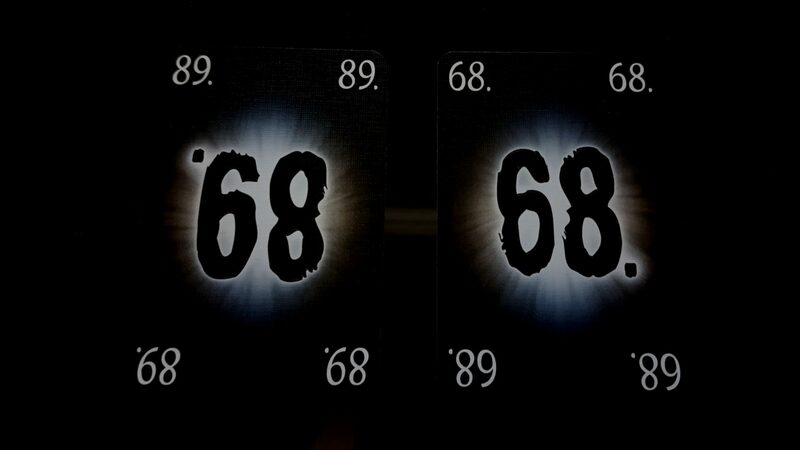 Which card here is the 68 and which is the 89? Answers in the comments please. You will get used to it, but it’s likely to be frustrating until that happens and might very well impact on play. Really the largest issue here is that you need to pick up on clues from body language and behaviour but those are almost always going to be visual. You need to see how people react to how you look at them, to see who is hesitant and who is strident, and when you have several people converging on an action but aren’t certain about it. Whether that’s appropriate or not depends on how well a player can read the body language of players around them. I think it would be tough for players impacted by issues in this category but in the end it’s going to depend on the specifics of a player and the group dynamics. You could certainly do some chewing of the scenery to help with this, but in the end that is likely to create as much confusion as anything else. We don’t recommend The Mind in this category. Games of constrained communication require ‘good faith’ when engaging with the mechanisms and that makes The Mind a more emotional game than a calculating one. To play well needs you to be able to build an empathic bridge between yourself and the other players, and gradually converge as a group to a shared understanding of time that permits delays to be interpreted. I’m not sure how I’d even rate that within a cognitive context – it’s an unusual system that is not at all straightforward to assess. Time perception is often a difficulty in circumstances of cognitive impairment, but within this specific situation I’m not sure that’s much of an indicator given how everyone contributes to that perception. There’s no benchmark here against which to assess correctness. As far as the more traditional aspects of the game go, no literacy is required and all that’s needed in terms of numeracy is the ability to count and seriate (which is to say, put things in order based on size or magnitude). Some simple comparisons of higher and lower at a distance are needed, but the level of formal arithmetic required is very low. Playing strategically can involve a degree of probability – ‘There are ten cards out there. I have a twenty, which means there are nineteen cards lower than mine and eighty that are higher…’. That’s not really where the heart of the game is and to do this is to essentially strike at the foundation of the experience. It’s a game of ‘feeling’ more than anything else – ‘feeling’ the right time to play based on how everyone around the table is responding. Game flow then is malleable, but only in terms of where a consensus of initiative emerges. You know what, let’s cut to the chase. I don’t know. I really don’t know. Let’s assume you take the game at face value – the central mechanism is social convergence upon a shared unspoken appreciation of time perception. It is unique, at least as far as games are concerned, and the heuristic lens we use for these sections offers only the shallowest ways of addressing that. Perhaps we need a recommendation grade that exists outside our usual framework – a NFI grade. Consider this section ‘unfinished’ – I’m going to see if I can draft in a professor of cognitive psychology to weigh in here because I’m honestly floundering. Check back in later if you’re interested – I’m going to call in help. In the meantime, let’s consider it a tentative recommendation in both categories. Anyone that has direct experience, please let me know. The Mind is a collaborative game and by all accounts it can get quite tense as the stakes get higher. The farther on you get in the game, the more difficult the task becomes and the higher the consequences get for failure. That said, the consequences are entirely artificial – the game of The Mind is in the social interplay, it’s not in the scoring. You play for the experience, not the outcome. Most of the game, as we discussed in the section on cognitive accessibility, lies in the ability of the table to converge upon a shared understanding of what hesitation means. That’s likely to be an issue for those with difficulties in reading body language and situating behaviour in its correct context. Social cues are going to be important and there are precious few signals to help interpret it. A player sitting back from the table usually means ‘I don’t think I have any cards to contribute’ but the stridency of otherwise associated might convey important information. It’s not as simple either as looking for common behaviour patterns like lying or bluffing. Everyone is going to be misleading everyone else not out of intention but because of the separation between what they know, what they suspect, and the odds that lurk in the background. That can short-circuit some of the usual clues that can help with the interpretation of behaviour. The person with the 99 might refuse to play a card because they can’t possibly have the lowest one. The same would be true of the person with the 100. Negotiating movement there requires a fair amount of eye contact and meaningful expression through non-verbal routes. It can be a lot to ask of people here, and it’s telling that this core mechanism, as I said in the review, is used in core threatre improve and classroom discipline exercises. Another problem is that there will be a clearly identified point of failure when something goes wrong. If you are too quick to play, or too slow to play, it’s easy for people to point fingers. ‘Why did you wait so long to play that ten?’, or ‘Argh, you played that ten when I had the nine – you shouldn’t have leapt in there’. In the event you’re playing in a group that doesn’t take this kind of thing as part of the fun of the experience there can be hard feelings and a kind of ‘blame apportioning’. At least two people will have screwed up in any failure – the person that played the card, and the person that didn’t play theirs. If you’ve been working your way through a high-level game a lot of progress can be killed off in a way that encourages people to disclaim responsibility by focusing it elsewhere. We’ll recommend The Mind here, because in the end the stakes are only what you make them and everyone is going to have the same problems interpreting body language because of the fundamental uncertainties at the core of the game. 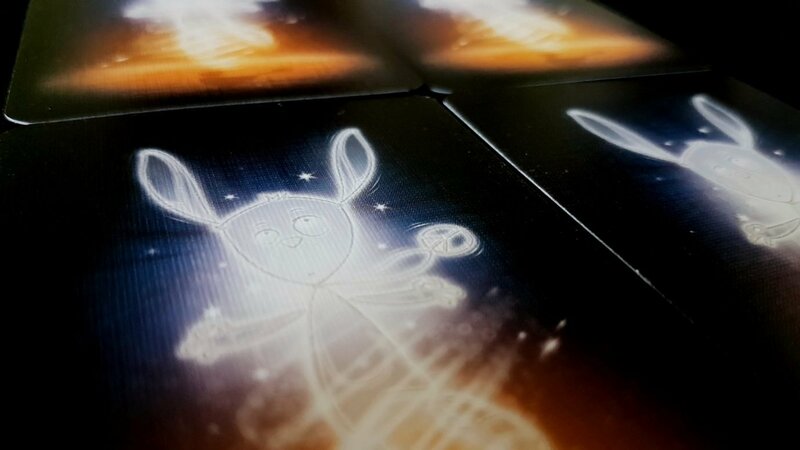 The core component interaction will be with a hand of cards, and a standard card holder will be suitable for this. The cards can be compressed so only their sides show if that’s necessary, although as mentioned above in the section on visual accessibility that’s not always going to be unambiguous. 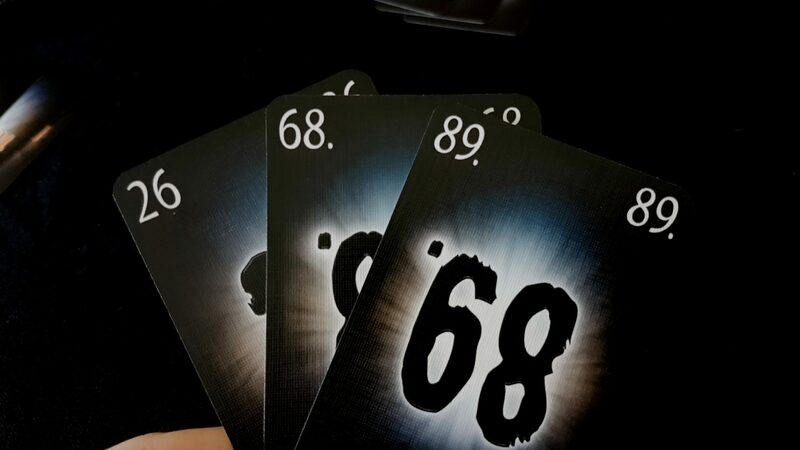 Play of The Mind in a physically accessible way is essentially going to involve some careful hesitation at appropriate points – time enough for someone, if necessary, to indicate a card that they wish to play. If there is an issue with fine grained motor control this might not be a problem because there’s no particular need to play quickly or neatly. However, if there is a more systemic issue with physical interaction we encounter a suite of problems. The first is that there is a degree of pantomime that often comes with playing a card. I extend my card ready to play. Someone else extends theirs. We look at each other. I tentatively extend my card forward. They draw theirs back. That suggests they think I have a better claim than they do. On the other hand, perhaps we both extend our cards a bit which suggests we both think that we have the next card in the sequence. This is a kind of ritual observance of hesitancy and it’s a key way game information is conveyed. That’s lost entirely if someone simply plays a card on behalf of another player because they can’t do any of that without looking at the card themselves. Even if they do, they can’t necessarily interpret that in the same way – everyone has their own set of conclusions about everyone around them and it’s not going to be transferable. Similarly, occasionally speed will be of the essence. Even if everyone is making a special effort to be accommodating for physical accessibility issues there are still going to be moments where people jump the gun. Let’s say the six has been played down. A physically impaired player has the seven. However, it wouldn’t be out of line for an abled player with the eight to slap it down because what are the odds they aren’t next anyway? Discipline at the table will help mitigate this but in the heat of play it’s hard to ensure that everyone gets a chance to act appropriately. In the event verbalisation is needed then a relaxation of the usual game rules will be necessary. In this, there’s potential for game information to leak into the way instructions are issued. ‘Card four’ in a firm, decisive voice says something different to ‘Caaaaard fooooooouuurrr?’ in a long, uncertain utterance. A lot of that information will be conveyed by body language anyway but there is a lack of ambiguity that comes with spoken instructions and that will need to be taken into account. With this in mind, we tentatively recommend The Mind in this category but bear in mind that it will require discipline from the table and might require players be willing to accept some verbal information cues to compensate for a lack of physical body language. There’s no need for literacy, although some of the level cards do come with some instructional text. Our version is in German though and it’s not a problem – mostly they just indicate the reward you get for beating the level and that’s either going to be a life or a shuriken. Otherwise the whole game is built around not audibly communicating and as such we strongly recommend it in this category. The only art in the game is the weird bunny thing on the cover and the oddly unthematic shuriken that are used as a way to discard the lowest cards. No other art is representational. I’m not sure what the RRP is going to be on the English version when it’s released, but the German edition costs about £10 and while it only supports a maximum of four players (at least, legally – I’ve played it with five and it was fine) it’s realistically cheap enough and light enough to be a safe addition to a game library. Those that like The Mind like it a lot – I’ve heard of people playing it dozens and dozens of times and delighting in introducing it to new groups. At around fifteen minutes of playtime too it’s an easy game to cycle around large player counts and reasonably entertaining to watch. It has a very agreeable property too as Ross over at More Games Please pointed out on Twitter – it’s practically frictionless as a way to introducing gaming to strangers. The rules explanation takes about thirty seconds, and it requires a lot of eyeballing and non-verbal interplay that can knock down a lot of social barriers that might otherwise exist in places like conventions or parties. Again, it’s not surprising this would be the case – theatres use similar exercises for a reason. 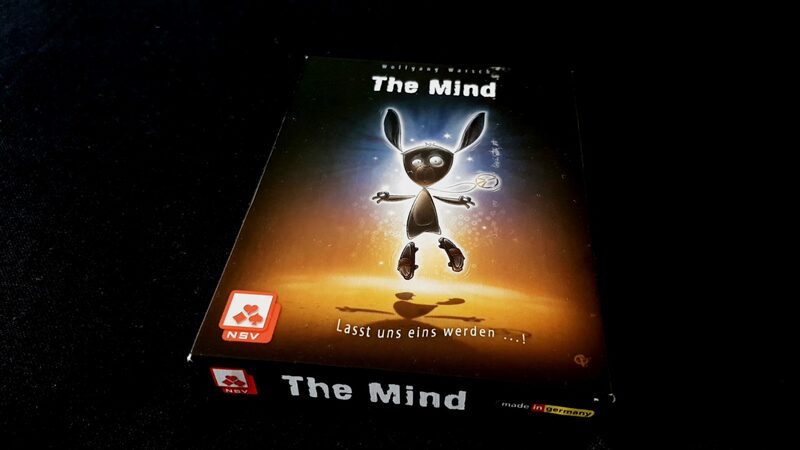 We’ll strongly recommend The Mind in this category on the assumption that the English release is approximately the same price as the German one. A communication impairment combined with a physical impairment here won’t prevent someone being able to play – exhaustive indication of options will be sufficient for playing a card. It will however hugely impact on a player’s ability to indicate hesitation, confidence and uncertainty. It could very well be enough to nudge the game out of accessibility in both categories as a result. Since we are hugely uncertain about the cognitive aspects of this, we’d be inclined to err on the side of caution – any intersection of cognitive impairment with another category of accessibility requirements would invalidate our already very tentative recommendation. On the other hand, we’ve already admitted that this game has stumped us in that category so maybe not? I’m sorry – I promise I’ll seek advice from someone that specialises in this kind of thing. At fifteen minutes of play time the Mind is very quick and slots well around conditions of modulating severity. Given the nature of the game though it’s not one that necessarily adapts itself well to changing player counts. Technically a player can tap out at the end of a level with no mechanistic impact on the game but that’s likely to change the dynamic around the table. It’s quick enough to stop and reset though when that happens. Well, The Mind has accomplished a first for the blog – it so comprehensively bested me in a category that I’m going to have to draft in help from someone smarter. It’s such a distinctively unique mechanism at the heart of the game that it needs a more nuanced take on the topic than I’m capable of providing. Good hustle, The Mind. There are only a few categories where we can be largely uncritically supportive of the game. For everything else we must be tentative – so much of it is derived from the emergence of a social consensus that it’s difficult to be too proscriptive. Much of this teardown has to be interpreted as an uncertain shrug of our metaphorical shoulders. At two stars in our review, The Mind isn’t a game that we’d be likely to recommend to your attention. That puts us, it seems, in a small minority. That’s absolutely fine – it has the appeal of familiarity. There’s no denying that as a packaged game it’s boldly experimental. It’s hard to pigeon hole and not an easy fit for the heuristic framework we apply to games. All we can do is the best we can – actually interpreting this discussion in a useful way is going to be up to you. Let us know what you find out.